SKH Weekend Picks- Feast, Color Run, and a Vegan Prom! Home > Blog > Culture > Events > SK&H Weekend Picks – Feast, Color Run, and a Vegan Prom! SK&H Weekend Picks – Feast, Color Run, and a Vegan Prom! It’s a busy weekend! That’s why SK&H has prepared a nifty cheat sheet for fun things to do in the coming days. Like food? There’s the fifth annual Feast festival as well as both the Polish and Serbian fests. Is being surrounded by colorful people and streets more your speed? 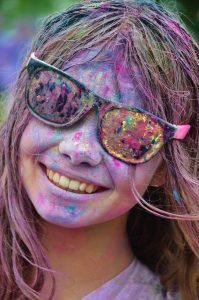 There’s the sidewalk chalk fest in Forest Grove and the Color Run at Portland International Raceway. And for vegans, there is a “prom” just for you! Have fun this weekend! Year five of Bon Appétit Presents Feast Portland includes four new Fun-Size events; a Latin theme for the Night Market, a ballin’ new east side location for the Sandwich Invitational, and over 100 chefs from around the world. It’s also a chance to give props to nationally known local chefs including Dougie Adams, Gregory Gourmet and the always incredible Naomi Pomeroy. Cost: Tickets vary per event. Wear a white shirt, and then get bombarded by handfuls of colored cornstarch as you run the Color Run 5K at Portland International Raceway. Get there early. It starts at 8 am! The Cruise to Historic Downtown Oregon City fills Main Street with 600 classic cars, hot rods, trucks, and motorcycles from the 1950s to 1970s. Create your masterpiece on a sidewalk in downtown Forest Grove, or admire hundreds of others’ works at Sidewalk Chalk Art Festival. Enjoy Polish food, beer, dance, music, and polka at the Polish Festival. Yes, polka! This is a celebration of the culture, and everything that comes with it, of the Serbian Orthodox people. Delicious Serbian food—barbecue, roast pig and lamb—live music, dancing, beer, wine, kid’s activities and much more. “Try Vegan Week” includes free workshops, speakers, dine-outs, and mentoring. It ends in a vegan prom night of dancing, raffles, food, and costumes. The week concludes with a Vegan Prom, that will include music, photos and costumes. Cost: Prom tickets are $10 advance, $15 at the door.